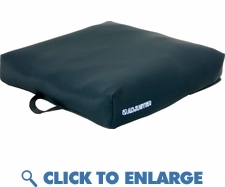 The Adjuster deluxe cushion provides a custom fit with maintenance free air cells. Rear middle compartment allows deep immersion, keeping the user from sliding forward. All sizes come standard with fluid proof lining. Five compartments may be adjusted for a custom fit. Adjustments may be made to accommodate severe left or right asymmetries. This elite air cushion is designed for advanced pressure redistribution.